FA: Bryan Law, Greg Barnes, Linda Jarit, August 2007. A stellar pitch following a cool natural feature, with lots of variety and sustained climbing in the 5.8/9 range. Climb the narrowing dike past the Stir Crazy crack and then up the face. Shares the anchor with Isostacy and is a good alternative first pitch. 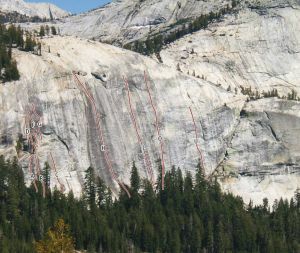 You can’t rappel to the ground unless you have two 70m ropes, but you can rappel to the slab and downclimb easy (3rd class) grooves. Which SuperTopo guidebooks include a topo for Felsic?